Every Friday is Bonus Friday at CES. . This is when 50-150 households receive food assistance through the free produce and food line. 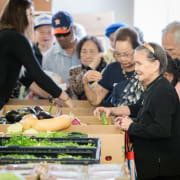 We need some individual volunteers who are willing to come to CES to help distribute produce, which consists of standing behind a table full of vegetables and fruit and restocking as clients walk past. It is a very interactive experience and volunteers leave feeling good knowing that they helped people live a healthier life We need volunteers (up to 5) from 12:45 to 3 pm every Friday. Speaking Spanish would be a plus!